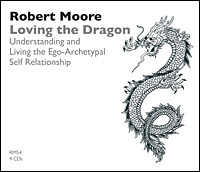 Through the experience of Jungian analysis and integrative spiritual practice, Dr. Moore leads the listener into into a deeper understanding of the challenge of building a more optimal conscious relationship to the Great Self Within. He examines the challenge of forming and developing a helpful conscious ego/Self connection, and assesses the state of conscious development and current practice in this key challenge of the individuation process. This workshop includes lecture, discussion, interpersonal sharing of experience, as well as experiential exercises. Download the pdf of the accompanying diagrams here.